The Outdoor Mega Combi Standard ODMC5 by Mistral is a floor standing oil boiler designed for homes with a high demand for hot water. This model uses condensing technology and has been specifically designed to be installed outside the home to help save you space. To protect it from the weather it has been finished in corrosion resistant casing. The pre-fitted frost stat prevents the boiler from freezing in the coldest weather when you need your boiler most. As a a Combi boiler it will supply both your hot water and heating on demand directly from the mains water supply. This means you don't need to have bulky tanks or cylinders making them perfect for homes where space may be limited. This boiler has an efficiency rating of 93% (A rated) and an output of 50kW making it perfectly suited for larger homes with 2 or more bathrooms. 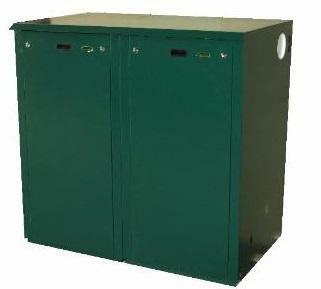 It’s also available in larger outputs up to 70 kW and as a non-condensing unit. Other key benefits include the multi directional flue outlet and a pre punched pipe access point to simplify installation. A 5 year warranty is included as standard to give you peace of mind.